I’m Just Sayin’… – Robin Raves – And Rants! Extinction is Forever – Help Save Endangered Values! Yes, the signs clearly point to the fact my values are in danger of becoming extinct. That’s sad, but it’s still encouraging. Like an environmental activist goes to bat for the ecosystem challenged gray wolf, or the whooping crane, I am out to save two of today’s socially challenged, endangered species I call ‘values’ and ‘ethics’. So, I’m asking you – my fellow archaic valued friends – to join me in my fight! It’s simple. For less than zero cents per day, you can keep doing what you’re doing. Keep smiling at the stranger, helping those in need, putting others before yourself. Do it every day. 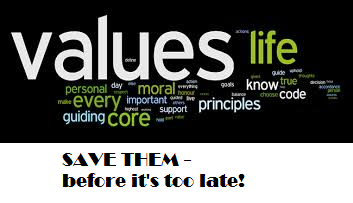 These poor, abused, abandoned values and ethics need YOUR help. Please, don’t turn your back on them. They would never turn their backs on you.